It's been a while ago since 2017's "Return of Planet X". Now, in 2019, it is finally time again for a new release. To start with. To kick off, I am presenting a project of 8+ years in the making: my ambient side project "Planet of the Arps". Featuring Roksana Vikaluk and Wolfram Spyra. Back in July 2010 I recorded the first version of an ambient music piece. It became a trip of one hour which might be at some points in the line of my solo work, but I decided that this project was about to be presented as an ambient side-project. To be called “Planet of the Arps”. The name refers to the musical phenomenon arpeggio (whether or not produced by an arpeggiator), Halton Arp and his Atlas of Peculiar Galaxies, Alan R. Pearlman and his legendary ARP-synthesizers, and it might be clear that it also winks to the “Planet of the Apes” science fiction franchise. As soon as the first version of the music piece was recorded, I had in mind to involve a fellow musician to contribute to this project, as I felt it needed an extra touch before it eventually could be released. When the Ricochet Gathering event took place in Berlin, in October 2010, I asked Wolfram Spyra to be part of this ambient work. Although ‘Der Spyra’ wanted to work on it, there seemed to be lack of time, and above all we both had other priorities at that moment. The project was set aside for the time being. 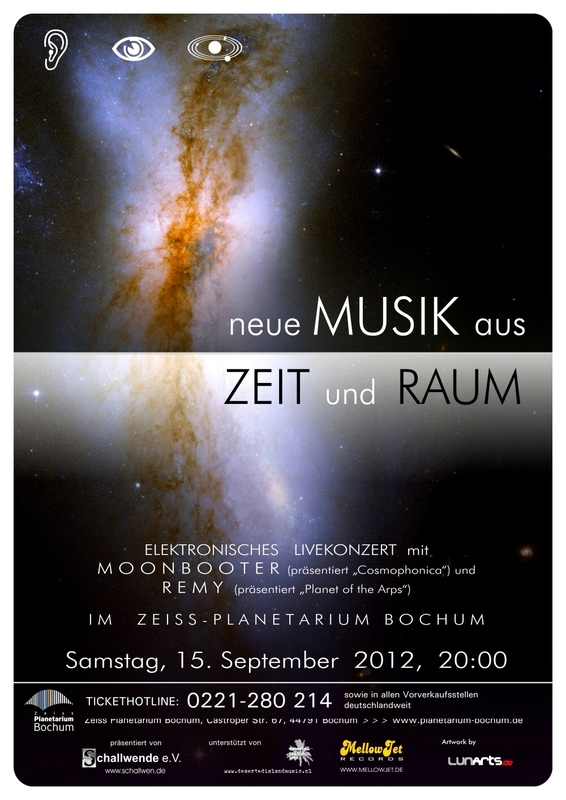 When I was invited to perform at the Zeiss Planetarium in Bochum (Germany), September 15th 2012, I decided to perform this particular piece of music. Simply because it was about to fit perfectly on this location. Some additions and edits were made, and during this solo concert version 2.0 was established. "Planet of the Arps" live at the Ruïne van Brederode. Then, almost two years passed since then, when I organised a concert evening at the Ruins of Brederode in Santpoort-Zuid (Netherlands), June 27th, 2014. For the line-up I programmed my band at that time, Free Arts Lab, as well as Wolfram Spyra. To conclude the evening, the idea came in mind to do an improvisation around an edited version of “Planet of the Arps”. Which took place in a different way I had in mind. Due to circumstances there was no time to rehearse the collaborational session, and just before the show it was decided that Spyra’s partner in crime and singer Roksana Vikaluk was about to join. Resulting into a 20 minutes live version of “Planet of the Arps”, in an entirely improvised setting. The outcome was, so to say, really exciting. Musically, as well as atmospheric, everything seemed to fall into its place. "Planet of the Arps" cover artwork. The original piece, remixed and sublemented with elements from the live performances. Let’s see it as a project which needed this time to evolve, and to result into the version to be heard on this “Planet of the Arps”. 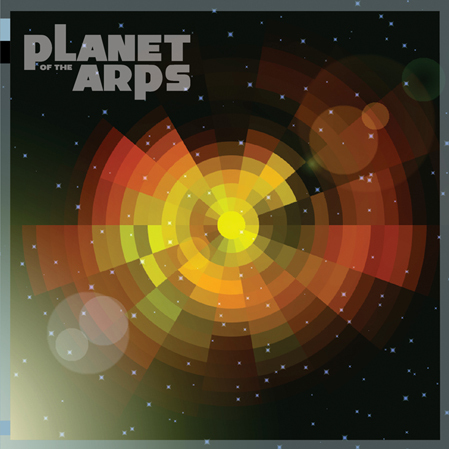 "Planet of the Arps" is available for pre-ordering from www.desertedislandmusic.nl. Release date is April 6th, where the cd will be presented at the E-Day Festival in Oirschot. From this point on, stay tuned for more exciting upcoming news. Including the celebration of the 20th anniversary of my debut "Exhibition of Dreams" later this year, as well as an entirely new REMY solo studio album.